Andy's boss, mobster Tim Briggs (Giovanni Ribisi), threatens to kill Chris' family if Andy doesn't pay him back $700,000. Chris decides to raise the money by running contraband, working with his former smuggling partner, Sebastian Abney (Ben Foster), who now owns a legitimate construction company. Promising Kate he will not run drugs, Chris joins a cargo ship, planning to buy $10,000,000 in fake bills in Panama and smuggle them into the U.S. He is joined by Andy, his good friend Danny Raymer (Lukas Haas), and gets help from crew mates. After Briggs breaks into Chris' house and intimidates his wife and children, Kate moves into Sebastian's house for safety. In Panama, Chris discovers that the only one who can provide high quality fake bills is crime lord Gonzalo (Diego Luna). Leaving Andy in the van with the money for the fake bills, Chris meets with Gonzalo to negotiate. Briggs calls Andy, threatens to kill one of Chris' sons and forces him to take the money and buy cocaine. With the money gone, Chris and Danny agree to help Gonzalo rob an armored car in exchange for the fake bills. After a shootout in which Gonzalo's group along with numerous police and security officers get killed, they successfully steal a Jackson Pollock painting that resembles a splattered tarp. Chris and Danny barely make it back to the ship with the fake bills and the painting. They drive the van with contraband into a container, which is loaded onto their cargo ship. Chris hits and berates Andy for using the money to buy cocaine, but apologizes when Andy explains the reason. It is revealed that Sebastian is working with Briggs, and he desperately needs money to pay gangster Jim Church (David O'Hara). Sebastian calls Chris and learns that Chris plans to get rid of the cocaine Andy bought. Sebastian instructs Briggs to threaten Kate. Through Kate, Briggs warns Chris not to dump the cocaine. Chris realizes that Sebastian has betrayed him. Sebastian contacts the cargo ship's Captain Camp (J. K. Simmons), with whom he has a partnership. He tells Camp of Chris' smuggled contraband, and promises him a share if he secures it. Unable to get Chris to give up the contraband, Camp calls U.S. Customs to inspect the ship in New Orleans. The Customs agents find the container with Chris' van, which is empty except for the paint splattered tarp, which they ignore. Once Chris is on shore, Briggs and his thugs demand the drug package. Chris takes Briggs to Camp's house, having made a duplicate key while on the ship, and knowingly activates the security system. Chris opens Camp's carpet cleaner and retrieves the cocaine from it. While Briggs and his gang sit in Camp's living room with the cocaine, Chris sneaks out. Camp awakens to the noise and comes into the living room as the police arrive. Both Briggs's group and Camp are arrested for possession of the cocaine. Warned by Chris, Kate leaves Sebastian's house. When she goes back to retrieve some personal items, Sebastian gets angry with her and accidentally pushes her against a bathtub. Thinking she is dead, he dumps her (unconscious) body in a yet to be poured foundation at one of his construction sites. Chris goes to Sebastian's construction site and manages to locate and save Kate by calling her cellphone. Sebastian is arrested and sent to prison, where he is greeted by a lynch mob. Danny retrieves the fake bills, which were dumped into the Mississippi River by Chris before docking in New Orleans. At a U.S. Customs auction, Andy buys the escape van earlier confiscated from the cargo ship, and finds the painting still in it. Church pays Chris $3 million for the fake currency and asks about the missing Jackson Pollock. Chris learns the painting can be fenced for over $20 million on the black market. The film ends with Chris, Kate, Andy and the boys beginning a new life in a waterfront house. Filming took place in New Orleans, Louisiana and Panama City. Contraband garnered mixed reviews from critics. It currently holds a 51/100 on Metacritic indicating "mixed or average reviews". Based on 156 reviews, the film currently holds a "rotten" score, 51%, from Rotten Tomatoes with the consensus saying: "It's more entertaining than your average January action thriller, but that isn't enough to excuse Contraband's lack of originality and unnecessarily convoluted plot." Roger Ebert of the Chicago Sun-Times gave the film 2/4 stars and felt that "Contraband involves a lot of energy," but he was growing "tired of violent retreads of these heist elements." Tom Long of The Detroit News criticized the film for having "too much plot and too little character" and concluded that it "comes off the factory floor with its engine running and ready to drive. But the ride feels overly familiar." Claudia Puig of USA Today called "the 'one last job' trope [...] a particularly tired one" and remarked that while it "has a few moments of tension," the film "adheres to a predictable heist formula hardly worth trafficking in." Andrew O'Hehir of Salon characterized the film as "exactly the sort of movie that Hollywood specializes in, the kind which seems on paper as if it ought to be entertaining, but winds up a massive and chaotic drag" and observed that "it's much more like a cynical hash job, whose faux-realistic manner can't hide all the hackneyed crime-movie situations." Peter Travers of Rolling Stone thought the film "goes down in a sea of Hollywood clichés" and that Mark "Wahlberg could sleepwalk through this role, and does. See this movie and you'll surely follow his lead." Kyle Smith of the New York Post derided the film, noting that "watching a hero progress due in large part to lucky breaks and idiot moves by others does not make a movie" and that "it's puzzling why anyone considered this script worth shooting." Scott Tobias of NPR dismissed the film as a "mediocre [...] thriller," something "to be remembered, vaguely." Rafer Guzman of Newsday expressed disappointment that "a little action is all you'll get" and opined that the film "fails by overreaching: It aspires to the heightened drama of The Departed but lands instead in the bargain bin of forgettable action product." Justin Chang of Variety praised the film as "reasonably swift and effective" and for taking "a hard-driving line of action and a commitment to one-damned-thing-after-another storytelling", while suffering from "preposterous detours." Michael O'Sullivan of The Washington Post compared the film to "an Ocean's Eleven movie, minus the glamour". Owen Gleiberman of Entertainment Weekly stated that the film, "while often grungy and far-fetched, does keep you watching", which is sufficient for a film released in January. Contraband was released to DVD on April 24, 2012 with a rating of R.
^ a b "Contraband (2012)". Box Office Mojo. Internet Movie Database. Retrieved March 15, 2012. ^ "Extras needed for 'Contraband' in New Orleans". On Location Vacations. Retrieved March 15, 2012. ^ "Contraband". Flixster. Rotten Tomatoes. Retrieved June 26, 2013. ^ Ebert, Roger (January 11, 2012). "Contraband". Chicago Sun-Times. Retrieved January 16, 2012. ^ Long, Tom (January 13, 2012). 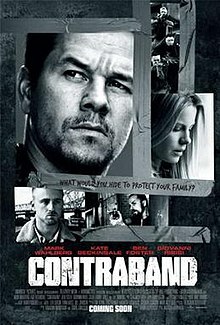 "Review: Efficient, energetic Mark Wahlberg action flick Contraband lacks character". The Detroit News. Retrieved January 16, 2012. ^ Puig, Claudia (January 13, 2012). "Contraband can't sneak its shortcomings past viewers". USA Today. Retrieved January 16, 2012. ^ O'Hehir, Andrew (January 11, 2012). "Contraband: A thriller Mark Wahlberg can't juice". Salon. Retrieved January 16, 2012. ^ Travers, Peter (January 13, 2012). "Contraband". Rolling Stone. Retrieved January 16, 2012. ^ Smith, Kyle (January 12, 2012). "Shooting blanks: Wahlberg's latest is a perfect storm of bad plot, miscasting and unbelievability. In other words, Contraband is Mark raving bad!". New York Post. Retrieved January 16, 2012. ^ Tobias, Scott (January 12, 2012). "Mark Wahlberg, After One Last Haul In 'Contraband'". NPR. Retrieved January 16, 2012. ^ Guzman, Rafer (January 11, 2012). "An action-deprived Contraband". Newsday. Retrieved January 16, 2012. ^ Chang, Justin (January 11, 2012). "Contraband". Variety. Retrieved January 16, 2012. ^ Sullivan, Michael (January 13, 2012). "Contraband". The Washington Post. Retrieved January 16, 2012. ^ Gleiberman, Owen (January 12, 2012). "Contraband". Entertainment Weekly. Retrieved January 16, 2012. ^ "Contraband - CompleteSeasonDVDs.com". Retrieved 14 May 2012.